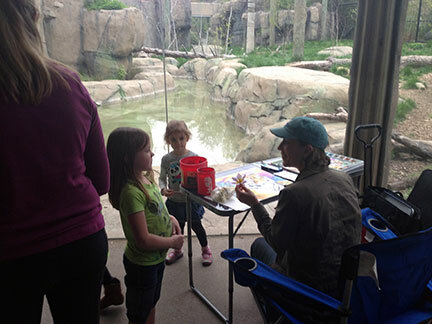 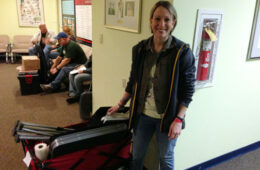 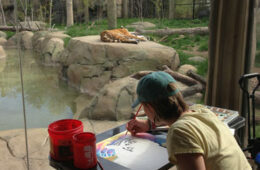 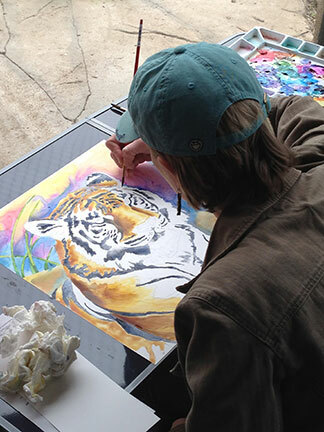 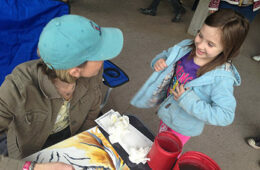 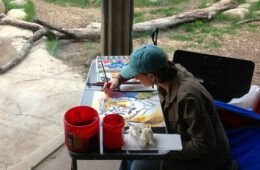 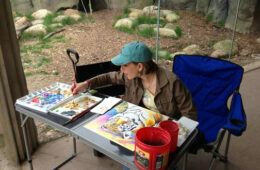 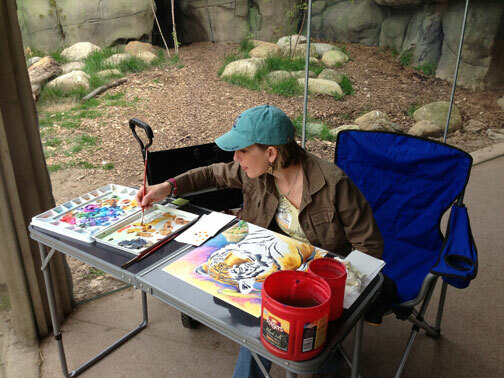 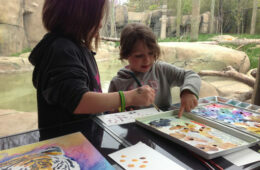 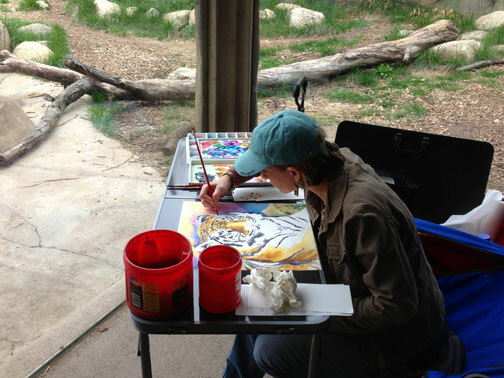 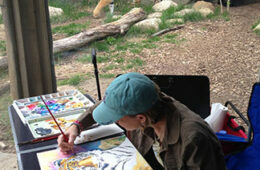 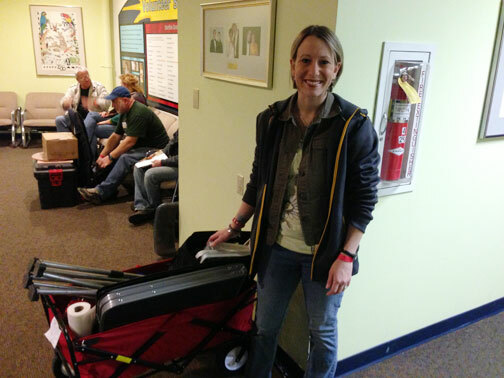 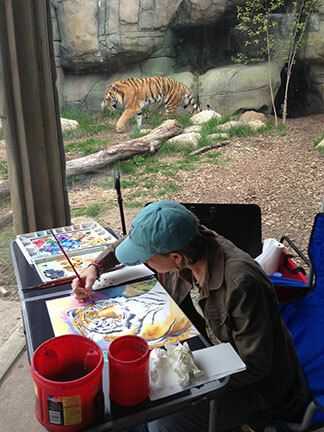 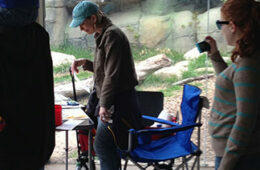 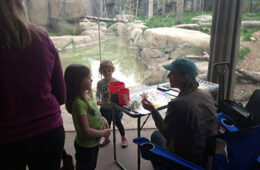 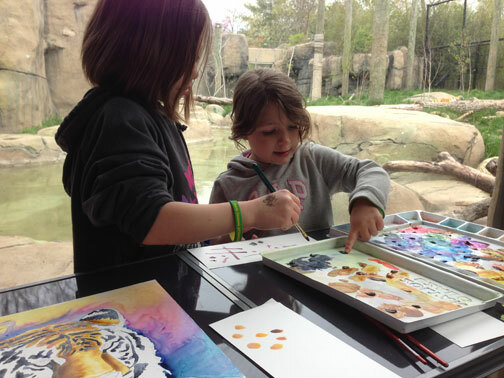 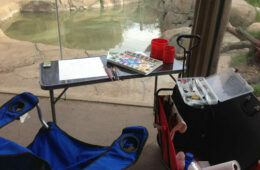 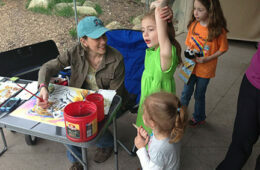 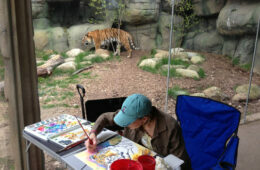 The Indianapolis Zoo puts on an annual fundraising event each year deemed the Naturally Inspired artist paint out. 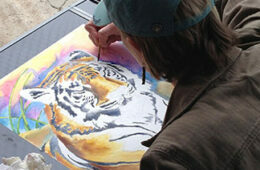 I was first selected for participation in 2006 and selected again in 2007 and 2008. 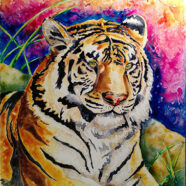 I am very grateful that I was selected again for the 2013 Naturally Inspired Paint out and Exhibit. 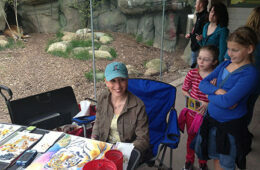 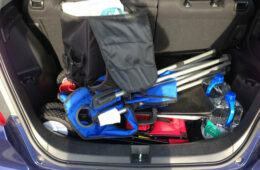 I thoroughly enjoyed the event this year. 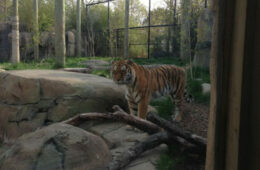 After running around the zoo and gardens multiple times, I felt like I made an actual connection with the Russian Tiger named Peter – in English. 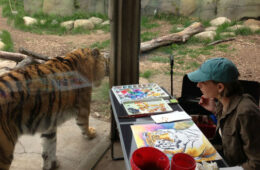 It was a great spot to set up and get a close up and personal experience with the tiger, maybe a little too close. 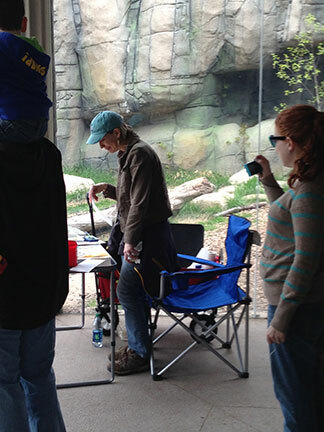 First thing in the morning after the set-up, there were zoo workers cleaning the area. 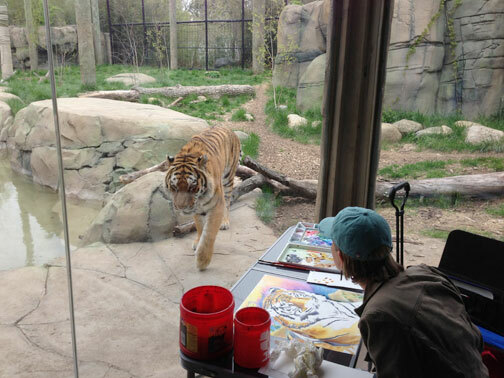 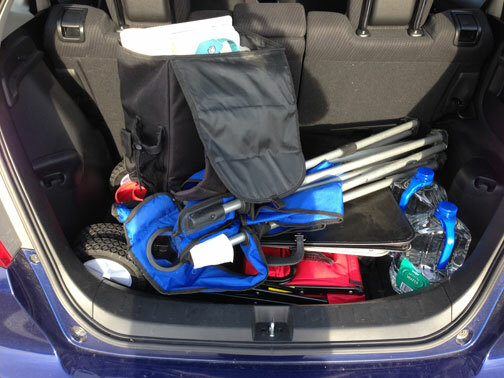 I looked down, then back up and the zookeepers were gone in a flash. 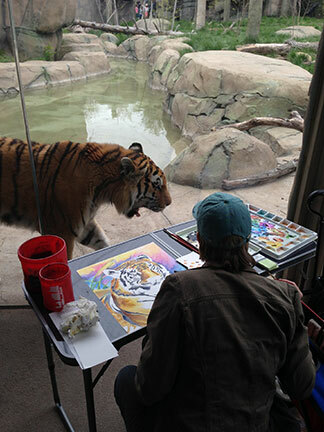 Within seconds, this bold tiger bolted out of a small opening came up and got in my face, showed his teeth and growled deadly right in my eyes. 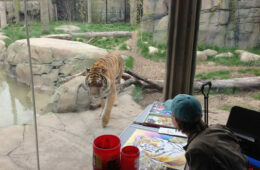 He just stared at me. 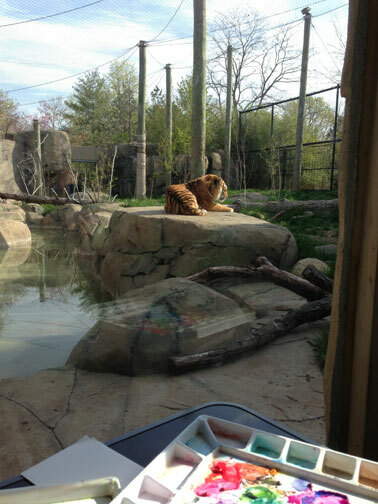 I am not sure if he was trying to figure out what I was doing or wanted to eat me for breakfast. I later found out there was only 2” of glass that separated Peter and I. 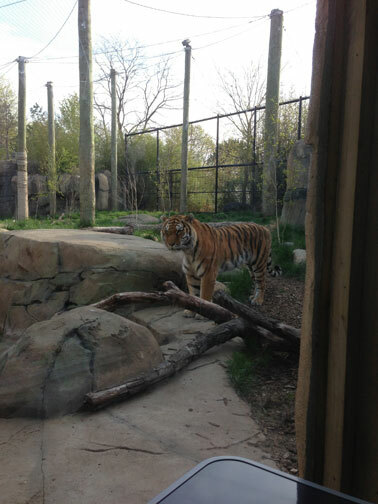 After the initial shock and awe of a huge tiger in my face, he was pretty peaceful moving around to four specific spots throughout the day. 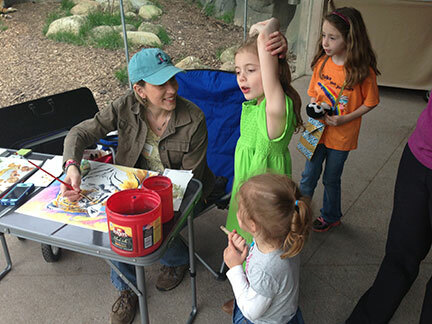 I was able to talk to three Girl Scout troops about art and help them get their painting badge and a variety of other people and children. 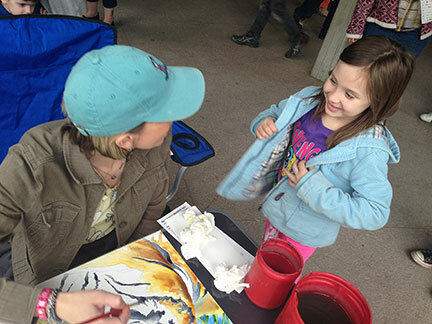 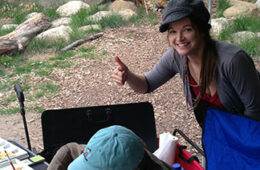 I even gave a little art lesson with a few children about watercolor painting and how it worked. 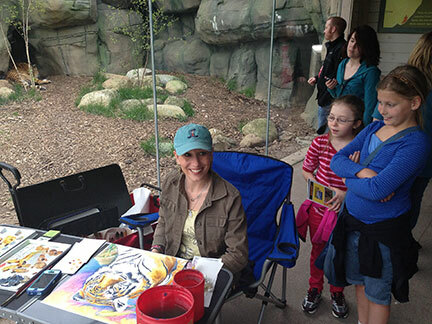 By the end of the day, many people came through and I made a ton of new friends. 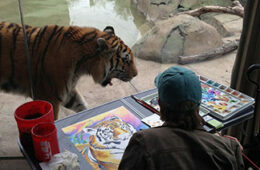 Luckily, this year the Indianapolis Zoo gave an extra couple of days to finish your work of art. 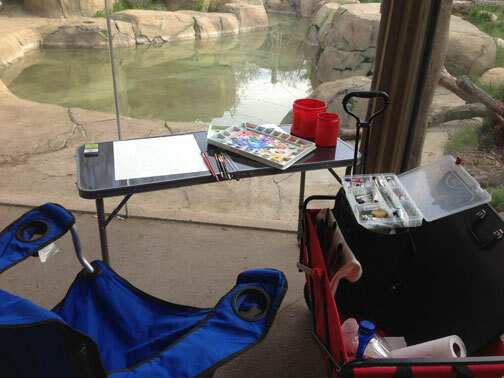 Between the weather being cool and overcast of rain, my watercolors wouldn’t dry. 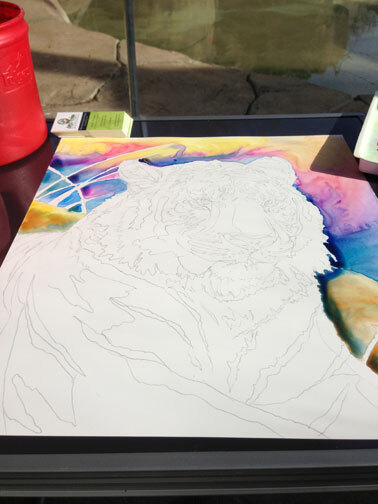 I tried air drying the paper with another piece of paper, to no avail. 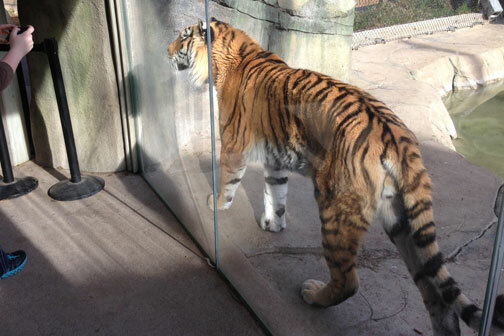 As things were winding down and time was running out, Peter the tiger (who seemed done for the day also) came back up to the glass to tell me goodbye. 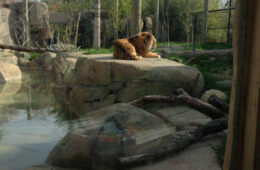 I was touched that he came back up to see me again, not bearing his large teeth. 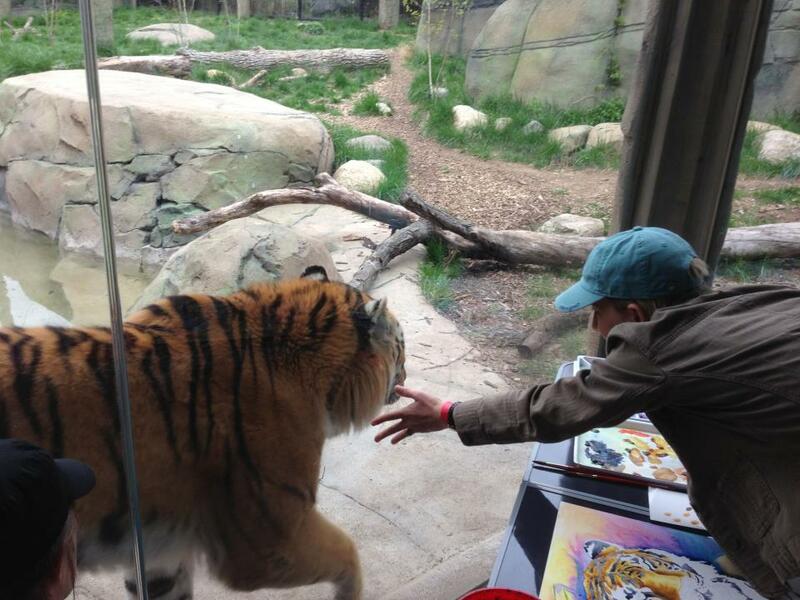 I know there was two inches of glass between us, but it was almost like he came back up to me to touch the glass and say our goodbyes. 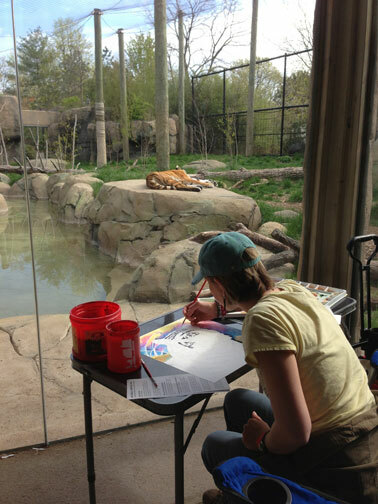 We are supposed to pick a subject matter that inspires us at the zoo. 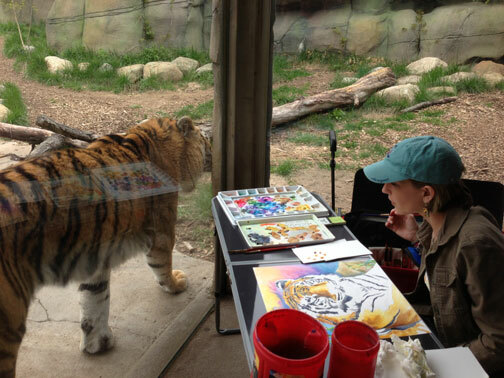 The tiger was not my original first choice to paint. 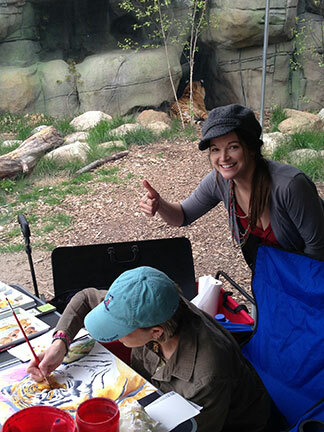 I was actually quite torn between what I was going to paint that day. 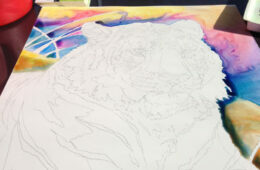 After everything is said and done, I went with my intuition, never having painted a tiger before, and tried. 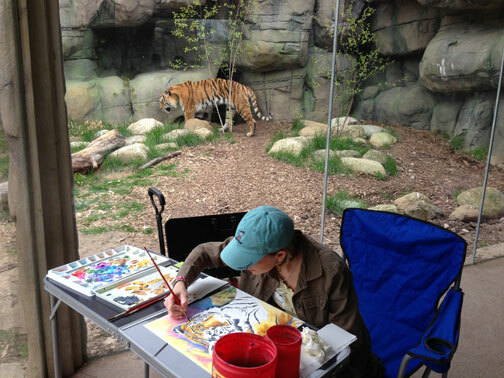 I love the outcome of the final piece and am really excited to keep painting different wildlife at the zoo. 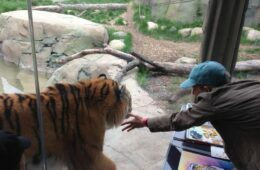 I went out of my comfort zone that day, but I gained respect and made a new friend in the process.